What Happened to Craig Kimbrel in the 9th? The Red Sox came up with a 4-3 win over the Yankees yesterday to clinch the ALDS series win and move on to face the Houston Astros in the ALCS. 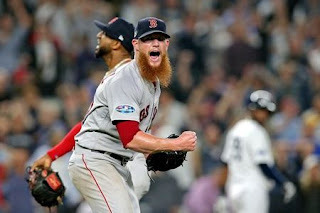 The Red Sox dominated for most of the game and really looked like the better team until the 9th inning, where they proceeded to nearly blow the game. So what exactly happened with Craig Kimbrel in the 9th? After Chris Sale threw a dominant 8th inning in relief, Alex Cora opted to bring in his closer to shut down the Yankees and guide the Sox to victory. Kimbrel eventually got the 3rd out on a close call ground out to 3rd base, but not before allowing 2 runs on 2 walks, a hit batter and a base hit. He also was just feet away from giving up a walk off grand slam to Gary Sanchez. Kimbrel is widely regarded as one of the most dominant closers in baseball, but has had a couple of tough outings this year. After a dominant 2017 in which he saved 35 games and had a 1.43 ERA, Kimbrel regressed a little in 2018. His ERA climbed to 2.74 and he gave up the most homers in any year of his career (7). Control has also been an issue, as Kimbrel issued 31 walks as opposed to last year’s 14. This was in 6.9 less innings pitched as well! Although Kimbrel has had some issues this year, most still see him as a shut-down pitcherer when it comes to closing out a game in the 9th. Cora sure seems comfortable putting him out there. So what exactly happened Tuesday night? One reason that some think Kimbrel struggled so much with control in the 9th was the slickness of the ball. It was a hot night, and Kimbrel seemed to be profusely sweating from the start. He also seemed to be wiping his hand on the dirt and his uniform quite a lot due to the moisture. Kimbrel himself said he thought the ball was a little slick as well, which could have played a factor. The heat and potential extra slickness on the ball could have played a part, but the high pressure of facing a stacked Yankees lineup in New York with the game on the line likely could have had an effect as well. Even for a closer as good as Kimbrel, this was no guaranteed easy situation. New York in October can be a scary place to play, and Kimbrel even had a beer can thrown at him by a fan while leaving the bullpen. Hopefully for the Sox, Tuesday was just an odd outlier game for Kimbrel and he regains composure and control if given chance vs the Astros and/or a potential NL Pennant winner.